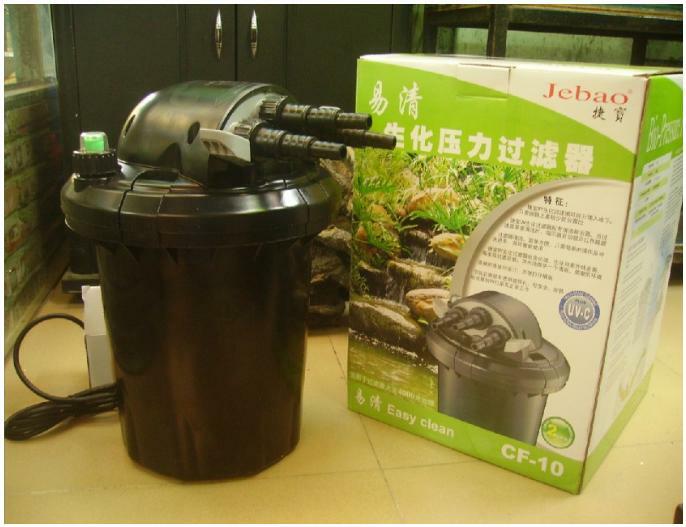 Jebao CF-10 UV Pressure Pond Filter with Backwash System for Sale! It provides 3-stage filtration for your pond systems! 1), Mechanical filtration.2 Bio Foam Sponges ( included ) collect all unwanted organic systems. 2), Biological filtration. Bio Balls (included) converts ammonia and nitrates into healthy into useful nitrates. 3), UV Sterilization. UV Light (included) kills algaes. Backwash-system-You just need press the auto-wash switch when the signal light turns red. Stepped down Outlets: 15/20mm &1"BSP Threaded outlet& 360 degree outlet fittings. This Pond Filter can be used outdoors or buried underground. Hailea H 4000 Pond Pump, $115. Resun King 3A Water Pump, $69. You can also try this Atman pond filter. excellent price and delivery. I am also very happy with the performance of Hailea H4000 pump.